You are here: Home / Fun Activities For Kids (By Age) / Fruit Kabobs for Kids = Good Food! We are having some food fun with fruit kabob snacks for kids today. Good food is wholesome, healthy, filling, and delicious. 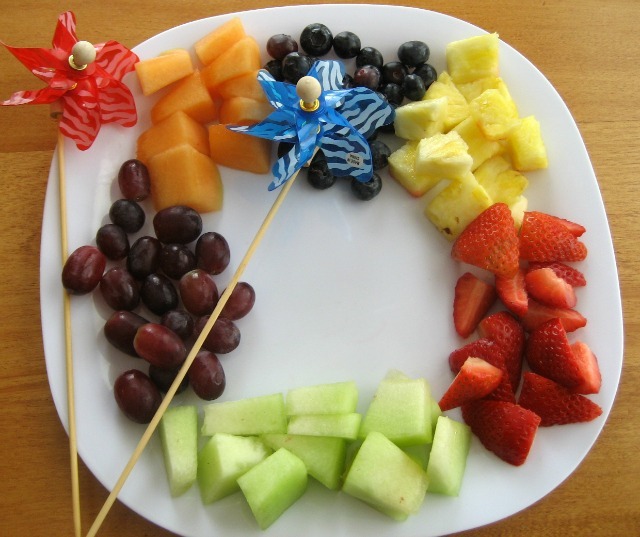 Fruit kabobs are a good food choice that is also colorful and loved by kids. 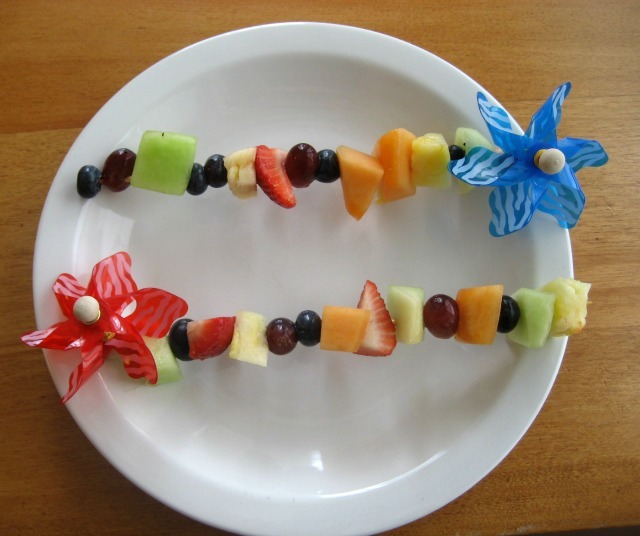 Kids Activities Blog hopes your little one enjoys this healthy and fun snack idea. Fruit is a wonderful snack for children. It contains all kinds of wonderful nutrients and it has a wonderful fresh taste. 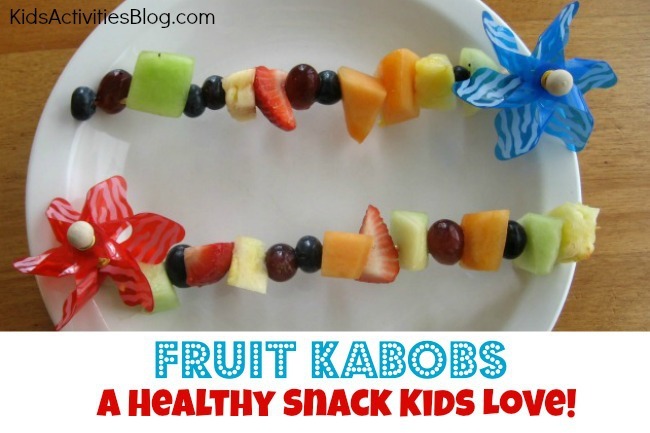 My son and I decided to create fruit kabobs that would contain some of his favorite fruits. We were able to pull some right out of our refrigerator and some we picked up at local grocery store’s salad bar. It was fun to talk about all the ways the fruit could be arranged on the kabobs sticks. By rainbow order (red, orange, yellow, green, blue, indigo and violet. We went for the random chaos approach with a twist. If the fruit was sampled and it wasn’t ripe enough or tasty enough, it wasn’t added to the skewer. Sometimes even favorite fruits aren’t favorites on a given day. The skewers I put out didn’t have a sharp tip. The fruit had to been pushed on rather than just slid on. Skewers with sharp tips can be a tad dangerous with preschooler and younger children. I try to avoid them when I can. These pinwheel skewers came with a dull tip. Hint: If you have some this sharp tips you might want to cut the tips off. This kind of snack is the perfect time to introduce new fruits. 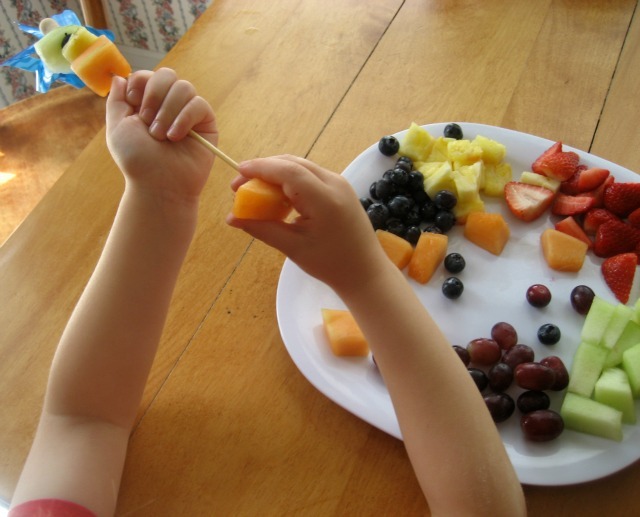 Children can sample a small piece of a new fruit and decide if they want to include it on their kabob. Some fruits are easier to push onto kabobs then others. Younger children or children with low muscle tone might need to work with really ripe fruit or ones that tend to be mushy. The fruit kabobs are so color and festive. It was really hard for one of us to wait until I took this picture to dig in to it.